The understanding of certain data often requires the collection of similar data from different places to be analysed and interpreted. Interoperability standards and ontologies, are facilitating data interchange around the world. However, beyond the existing networks and advances for data transfer, data sharing protocols to support multilateral agreements are useful to exploit the knowledge of distributed Data Warehouses. The access to a certain data set in a federated Data Warehouse may be constrained by the requirement to deliver another specific data set. When bilateral agreements between two nodes of a network are not enough to solve the constraints for accessing to a certain data set, multilateral agreements for data exchange are needed. We present the implementation of a Multi-Agent System for multilateral exchange agreements of clinical data, and evaluate how those multilateral agreements increase the percentage of data collected by a single node from the total amount of data available in the network. Different strategies to reduce the number of messages needed to achieve an agreement are also considered. The results show that with this collaborative sharing scenario the percentage of data collected dramaticaly improve from bilateral agreements to multilateral ones, up to reach almost all data available in the network. LLuch-Ariet, M., de la Torre, A.B., Vallverdu, F., Pegueroles, J. 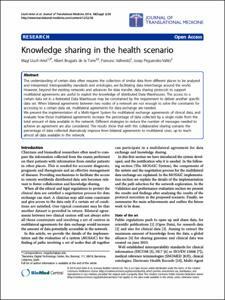 Knowledge sharing in the health scenario. "Journal of translational medicine", 28 Novembre 2014, vol. 12, núm. 2, p. 1-12.